Is marriage naturally better the second time around? Our next-door neighbor Suzanne passed away unexpectedly six days ago. On Monday she was complaining about her gut hurting. On Tuesday she had a four-hour surgery to try to repair an intestinal blockage. She moved from surgery to critical care. On Wednesday afternoon she was dead, her husband Bill became a widower and everyone on our little cul-de-sac was in a state of shock and grief. Yesterday I went to the local funeral home to pay our respects and to celebrate her life. We’ll be trying to come to terms with this for a long time because Suzanne was a terrific neighbor: always friendly and helpful. She made our little street a real community. Her New Year’s Day parties were renown here in our 55+ community. It seems kind of crazy to feel loss, as we knew her only two years, but we do. The night of her death, I slept fitfully at best. She and Bill were an item and were one of those crazy, always-together, supremely happily married couples that are actually hard to find. When not traveling they could be found daily on bikes or long walks, and when walking were hand in hand. There was a tangible intimacy between her and Bill that just radiated from them. When Bill told me the story of his first date with Suzanne ten years ago, his voice picked up and his face glowed. At her funeral he said without a doubt that their ten years together, eight of them married, were the best years of his life. The truth is I was more than a little jealous of Bill and Suzanne’s relationship. It was the sort of marriage most of us aspire to have but don’t have. It was also second time around for both Bill and Suzanne, having divorced or lost spouses. I’m 32 years this month into my first marriage and don’t plan to change the situation. Still it’s obvious that my marriage can’t compete with theirs. I married a fellow introvert. We love each other and now that we are retired obviously see plenty of each other. We share some passions like Star Trek and politics but mostly inhabit our individual universes, intersecting mostly in the morning and at meal times. I’m hardly alone in thinking this way. Yesterday at the wake I chatted with many of the couples present. Without exception they agreed that Bill and Suzanne were exceptionally well matched. Their marriages could not compete. I have noticed of those couples whose marriages I think are exceptionally intimate, they all seem to be second marriages. Thinking through the marriages I know well, like those of my siblings, all still on their first marriage none of theirs resemble Bill and Suzanne’s. Bill and Suzanne were an older couple (I was shocked to learn Suzanne was 81; she certainly didn’t look it) that nevertheless seemed eternal newlyweds. There was such an honest passion and intimacy between them that it seemed somewhat surreal. And it carried over to their larger lives. It touched us as next-door neighbors. It was like their house at the end of the cul-de-sac radiated happiness and warmth. The cause of her death appeared to be due to an earlier cancer that went into remission, but which left her intestinal wall thin. She had the bad luck of having an obstruction at the spot, which tore the wall, which caused peritonitis. These days you sort of expect people to die slowly, at least from natural causes. When I heard she was in critical care I figured it was nothing to worry about. Someone with such spirit of life as Suzanne would doubtless pull through. But she didn’t. Bill seems to be handling her death pretty well, expressing deep gratitude for their time together and hope they will meet again in some nebulous afterlife. Here’s hoping, Bill. Ten years of the kind of relationship you and Suzanne had should have more than filled your cup to overflowing. Perhaps that’s why Bill is handling it so well. He knows he was blessed to have these years together with her. What remains is a sense of profound gratitude rather than the deep loss I expected. Perhaps the loss will manifest itself in Bill in time. There may be something to this second time around being better. It makes a lot of sense when I think about it. What are the odds that a first marriage will actually last a lifetime? Consider that most marry young and that both are thrust into adulthood, usually with children to quickly follow. There are so many natural tensions to deal with in a first marriage: jobs, kids, aging parents, aging people with changing needs, likely unemployment somewhere along the journey, general societal stress, siblings, toxic coworkers and maybe bad neighbors. That so many first marriages survive at all is amazing, although it gives us no insight into the quality of these marriages. I know in my case, having a life partner is deeply gratifying. With our daughter all grown up and with both of us retired, this phase of our marriage is quite sweet. We are hardly alone. It’s a phenomenon psychologists know well. Remove a lot of the stressors from a marriage and its overall quality will likely improve. Still, I think there must be something about a second marriage that by its nature will make it likelier to be better than a first marriage. It’s likelier that fewer marriage stressors like kids and jobs will exist in a second marriage. Hopefully you have a chance to reflect on what you did to stress the first marriage and take corrective action in the second one. Most likely you will be more focused on shared interests and compatible natures than beauty, Donald Trump being the exception. Those of us in first marriages deal with the marriage as it has evolved over a very long time. We know our partner as intimately as you can possibly know someone. What you eventually end up with is someone imperfect and with foibles just like you. Perhaps in a second marriage these imperfections become easier to overlook as they take a long time to discover. Maybe that in some part explains Bill and Suzanne’s good fortune together. Or perhaps you get a better sense of the spouse you need now since the rose-colored glasses are off. The spouse you had then doesn’t quite fill your criteria anymore. 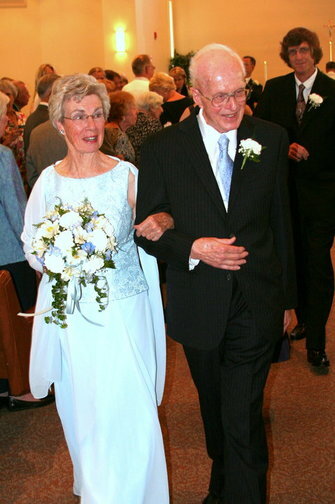 My own father remarried late in life, and had five years together with my stepmother before passing last year at 89. I don’t know if it was a better marriage than the 55 years with my mother, but it certainly was a different marriage. It allowed my father to grow in his last years, which was good, and gave him the companionship he craved. Should I also suffer my father’s fate of being a widower and choose to remarry, I won’t be surprised if I find that it sweeter. By no means would I say this is because there were things about my spouse that were unlovable. But just as a plant that is repotted in fresh soil often perks up, I suspect people can too. Should I predecease my wife, I certainly hope she finds a new love. It would give me pleasure to know that someone else would have the joy of her presence if I cannot. As for Suzanne, you are already missed and have left a hole in our lives. It will never quite be the same. So I am sitting in a conference room in Lakewood, Colorado. My laptop is purring away and I am enmeshed in the business of making money. But since I have internet, I have GMail open in a tab in my browser window. When I checked it periodically, it was full of the usual drivel, which are mostly various political campaigns and organizations grubbing for money or asking me to sign a web petition. This time the subject of the email nearly gave me a heart attack. In big capital letters my father was announcing he was getting married. I have nothing against marriage, being married nearly a quarter of a century myself. What you do not expect is that your father, after fifty-five years of marriage and who will turn eighty-four this autumn would be getting remarried. While certainly not immoral or illegal, it feels deeply unnatural. It’s like snow falling in Miami. If something bizarre like this ever happens to you, you will probably react a lot like I did. You sort of sit around dazed for a while not comprehending the news and wondering if this is some sort of late April Fools joke. Once the initial shock wore off, I found that I was overcome with a mixture of feelings. There was a vague sort of happiness for my father. After all, who doesn’t want their parent to be happy, particularly in old age? There was also a touch of concern. Just how well does he really know this woman anyhow? Then there was my selfish side manifesting itself. If he dies married to her, will she inherit everything? Would his estate eventually end up with her children and grandchildren? There was also a touch of anger: how dare this woman come between me and my father! Maybe he would be happier being married, but the chances are his marriage would perturb our close relationship. Would she control him to the point that my relationship with Dad became wholly superficial? There was also amazement: why on earth would anyone want the hassle of getting remarried at his age? Does he want to be sexually active in his eighties? I had never broached the subject, of course, but I sort of assumed at age eighty plus, even if the desire was there, the ability to perform probably wasn’t. And there was a certain amount of relief. When it is his time to leave this planet, I won’t necessarily need to be at his side for days or weeks at a time watching him slip further and further into the void. His new wife will have the bulk of the duty. That my father wanted to get married again was not in itself a surprise. My mother was hardly resting in her urn in the cemetery five years ago before he was checking out the many available widows at his retirement community. In fact, within months of my mother’s death, he had proposed to a woman a floor below him. She liked my father, but she just wanted to be friends. So friends they were. Yet I suspect that much of my Dad’s interest in her was the wan hope that friendship might eventually yield love. Of course, it never did. Years passed and he finally figured out that he was wasting time. Otherwise, he seemed very happy. Unlike me, he is naturally affable and sociable. In a retirement community of thousands, it seemed he knew everyone’s name. So I wasn’t too surprised when he started dating Marie. Maybe I should have put two and two together when over the winter he took her to California to meet his sister, but I didn’t. I finally met her a few weeks ago, but I assumed she was just a girlfriend, some arm candy. She seemed nice enough, but I hardly had a chance to form more than a superficial impression of her. And now my Dad and this Marie woman are going to get married! They are scouting for a new apartment in their retirement community. I am warned there will soon be furniture to excess. Maybe this is as close as I will get to my share of his inheritance. In truth, my father has been undergoing a late life renaissance for a number of years. Overall, I have been impressed with his ability to squeeze so much joy from this time of life. He was also fortunate to be a reasonably healthy and mobile male in a community where the men his age had mostly died off. If they had not died off, they were on their last legs. Still, I figured when I am his age, I might be principally dwelling on death. Instead, he is reveling in life in his retirement community, joining clubs, ushering at church, and even taking up square dancing. The square dancing thing took me for a jag. I come from a family of Dilberts with no hand eye coordination, but here he was with a Square Dancing for Dummies book, a weekly practice session and soon he was dancing with the dames. I keep wondering, how will he surprise me next? Will he take up smoking, even though he never put a cigarette to his mouth? Will he start drinking, although the closest he came to drinking was sipping communion wine? Marie is apparently Irish. The good news is that means (unsurprisingly) that she is Catholic, still an important criteria for a spouse for my devout Catholic father. The bad news is that the Irish in general have a propensity for booze. So there might be plenty of alcohol at their wedding, date TBA. And he will probably be dancing for joy whilst my siblings and I are likely to be hanging on the sidelines and queuing up for carrots at the vegetable tray. And then there’s his wife to be, my future (and the word is so hard to say aloud) stepmother. Here I am at age 53 and the last thing I expected to happen to me at my ripe age is in a new relationship with a stepmother. Should I call her Mom? I don’t think Marie would expect me to, and I hope she does not because Marie is probably all I will be able to muster. Thus far “Mom” has been reserved only for my biological mother (may she rest in peace) and my mother-in-law. I call my mother-in-law “Mom” only because I know she likes to hear it and she thinks of me as her son, somehow. I haven’t the heart to tell her I don’t think of her as my mother, never have and never will. However, I am pragmatic enough to realize that calling her “Mom” does do a lot for maintaining a harmonious relationship with her. For the most part my siblings have not weighed in on this impending nuptial. I suspect most realize what I do: there nothing we can do about it anyhow and if we tried to interfere it would only generate bad karma. So if it makes Dad happy in his golden years, why not give him our blessing? So I will, but not without stifling some of my negative feelings. I am not the only relative feeling some shock. My niece posted yesterday on Facebook, “My grandpa is ENGAGED?!?!?!? !” Exactly! It’s like the earth decided to rotate from west to east all of a sudden. Whether this remarriage is ultimately good, bad or indifferent, my boat is being rocked. I don’t have to like it, but I have the feeling I best get used to the turbulence. So Al and Tipper Gore are heading for separate residences. Forty years of a storybook marriage appear to be over. Many of us who have followed the Gores all these years are just shocked by this turn of events. If marriages are to break up, most will break up within the first seven years. It makes no sense for a couple to break up after forty years of marriage, particularly a publicly affectionate couple like the Gores who in 2003 wrote the book Joined at the Heart about the changing American family. Who would have thunk their marriage would now be disjoined at the heart? Gosh darn it Al and Tipper, even if you were having marital problems, you were supposed to keep them in the closet and carry on. America needed to believe that both of you were committed to each other for life and that your marital bond was unbreakable. While a lifelong, happy marriage is apparently not possible for most of us, at least yours would be. With your separation, you have gone all human like the rest of us. The good news is that according to the couple no infidelity was involved. At least that is what we are hearing now. Who knows what news reports we may read about in the next few weeks or months? How long before Al has some younger piece of arm candy, and the rumors start to fly? Rest assured if there were any dirt on their marriage, it would come out soon. For the moment, their marital breakup suddenly out shadows the doings of Sarah Palin and her extended family. Still, if one were looking for signs of marital stress in Al and Tipper’s marriage, there were some tealeaves to read. For one, after Al Gore lost his presidential bid and took up the environment as his new passion, he was suddenly gone from home a lot. He was jetting here, jetting there, jetting anywhere and not coming home much. Could much of that time away from home, most of it apparently without Tipper, been his way of coping with a bad marital situation? A physical separation even if it was not a legal separation? Then there was his sudden weight gain. For most of his life, Al had been at normal weight, and suddenly he got all Warren Harding on us. Maybe he got so myopic about saving the planet that he forgot about eating healthy and exercise. On the other hand, since he spent so much time in airports maybe he had no choice but to dine on their greasy junk. Or perhaps there was a lot of marital stress at home and he compensated by overeating. Fortunately, he managed to take off most of the weight. However, a sudden and large weight gain in anyone is usually a sign that someone is under unusual stress. I know in my case I tended to weigh the most when I felt under the most stress. There were no such clues from Tipper, but then again we were not paying attention to her, as she prefers to spend most of her life offstage. What went wrong? I frankly hope we don’t find out, but I suspect we will at some point. There must be enough cash some publisher will throw at them for one of them to write a tell-all book. I hope that neither succumbs. For the moment, close friends express bafflement. Whatever marital woes beset their relationship, they kept them far from public view. What the Gore separation represents then has more to do with spoiling our illusions than the end of their long-standing marriage. With blood relations, you have little choice but to hang in there for life. I am fortunate to love and respect my siblings as well as my father (my mother died in 2005), but even in families where there is a lot of hurt feelings and rivalries, rarely will relations separate for life by choice. Despite all the sober words at the start of a marriage, marriages are ultimately optional relationships. It is true that for much of human history marriages were for truly for life. This did not necessarily make them happier, but they did endure. Today, if you cannot work it out, you divorce and move on. If, as I suspect, your next relationship means you are largely revisiting the same issues you had in your marriage, then perhaps divorce is pointless. Any divorce is a gamble that your future you will be happier than you were in your marriage. I also strongly suspect that marriages are not naturally meant to endure for life. Some do, and some percent of those that do are perhaps overall generally healthy and happy marriages. Marriages lasting forty or more years, like the Gores, are a fairly recent phenomenon. The primary purpose of marriage these days is to provide a stable and healthy environment to raise a family. Until recently, you often did not get a chance to see your grandchildren. Those that did were lucky to have their spouse alive after twenty or twenty five years. If, as it appears, the Gores had thirty-five years or so of a happy and healthy marriage, then they were probably extremely fortunate. Most of us will not be so fortunate. I hate to characterize my own marriage for public consumption, but I suspect it is typical of most marriages nearly a quarter century in length. My wife and I love each other, but like all marriages, ours too has its issues. Neither of us is anxious to head for the exit, but neither are we the enchanted young adults that we were when we married in 1985. We do grate on each other, some days more than other, but apparently not to the extent that we want to live lives apart from one another. In any event, neither of us particularly embraces change, which helps keep us as a “still married” statistic. At the same time, neither of us are naïve enough to think that divorce could not happen to us. All marriages are consensual. For most of us old married people, success in marriage is about succeeding in scaling back expectations of what marriage should be. So rather than get too upset about the Gores breaking up, why not raise a glass to what appears to be a really good and long run? It appears they had thirty-five years or so of a really good marriage. Most of us would be thrilled to have ten years of excellent marriage, let alone thirty-five. Divorce is not always a bad thing. It can also be liberating. It may be that at this stage in their lives it is the best thing for both Al and Tipper. If so, I’ll raise my glass for both of them having the good sense and the courage to move on.